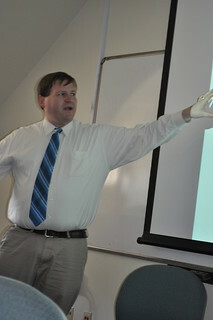 Piracy has become more and more economically relevant in recent years, with "$12 billion in additional shipping costs added to the global economy every year as a result of piracy," said START researcher Brandon Behlendorf during his July 3 Research Roundtable on maritime piracy. He noted that those costs are concentrated in the Malacca Strait and the Gulf of Aden. Behlendorf also said that average ransom costs rose from $166,000 in 2001 to $5.4 million in 2010. Data on piracy incidents are recorded in a database as a series of pirate and crew actions and reactions; these 'scripts' are used to address the question, "What are the situational, opportunistic and structural factors that prevent or induce a successful piracy event? The database contains 2,461 cases of piracy or armed robbery off the coasts of 91 countries and in international waters between 2005 and 2010. 58 percent of successful boardings became successful robberies (theft of items and escape in the same day). Behlendorf said that the odds of a successful attempted boarding increase in territorial waters, on anchored ships and when the pirates are armed but disciplined in their use of firearms. The data also suggested that the crew's actions, such as sounding alarms, using fire hoses, using more lights at night, and a maintaining a more vigilant posture are more strongly correlated with the failure of attempted boardings than the actions of the pirates or the structural circumstances of the incident. "When you use [these tactics] are just as important as [which tactics] you use," Behlendorf said. In his research for START, Behlendorf applies quantitative geospatial modeling to terrorist targeting strategies, maritime piracy and transnational criminal activity. He is also a doctoral candidate in criminology at the University of Maryland, where he focuses on neighborhood patterns of crime and victimization within developing countries. Previously, he was a researcher with the Ohio Department of Public Safety, where he coordinated a multi-agency evaluation of a commercial vehicle diversion program and assisted in the creation of risk management programs and assessments for the Ohio State Highway Patrol.